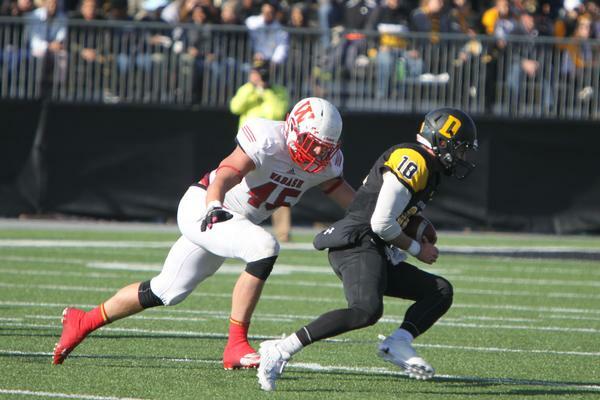 Record-setting seventh-straight Monon Bell win. 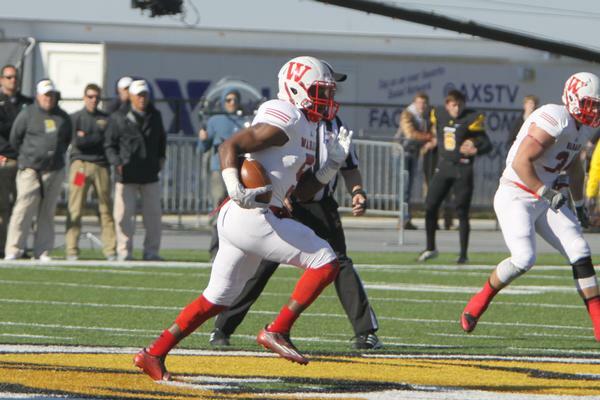 Two 63-year-old individual rushing records broken. 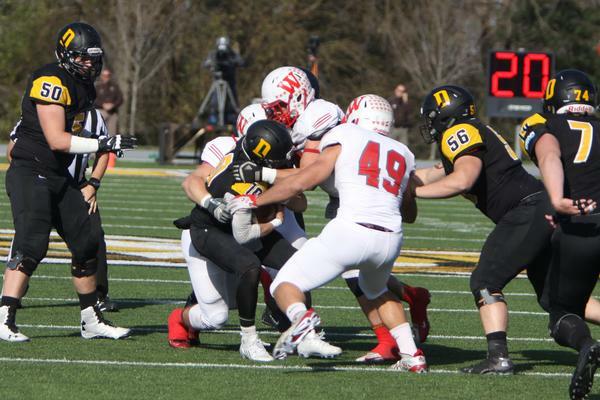 Wabash’s 45-17 win over DePauw (8-2) in the Monon Bell Classic, telecast nationwide, was as satisfying for players, coaches, and fans as any win could ever be. The Little Giants (10-0) completed an undefeated regular season. 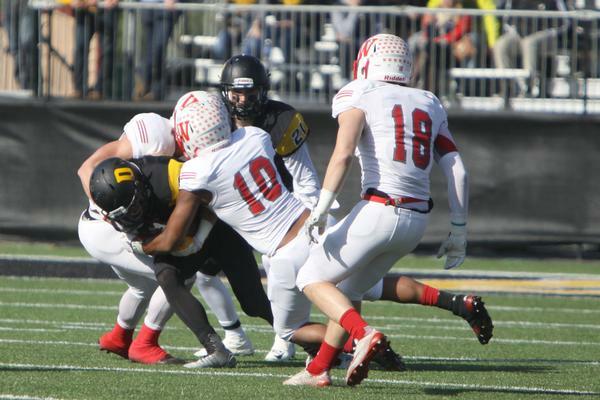 The win earns the Little Giants a berth in the NCAA Div.III football playoffs. The Little Giants will host 9-1 Albion, champions of the Michigan Intercollegiate Athletic Association. No team has ever won seven straight since the old Monon Bell was added to the series in 1932. 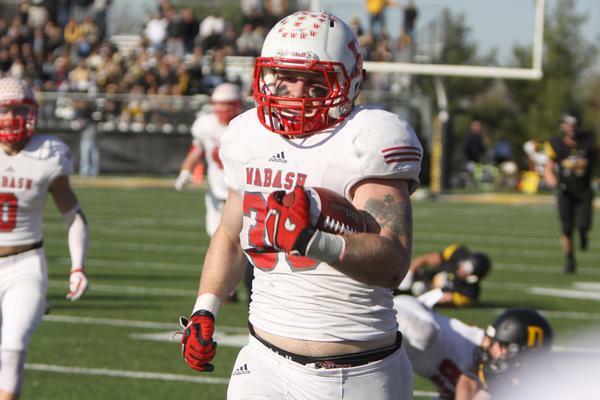 Wabash now holds a seven-game streak and an overall edge of 60-52 with 9 ties. The Little Giants won six in a row from 1949-1954, and set the record with seven in a row from 1921-1927. 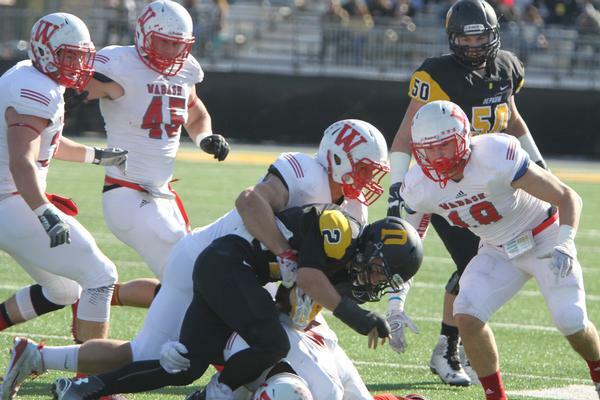 Wabash has outscored DePauw 257-67 during the current streak. 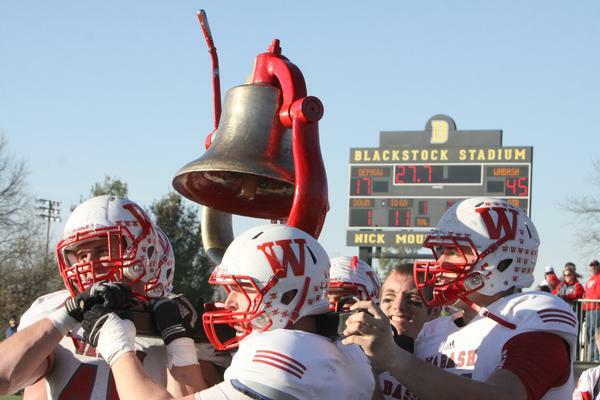 “Another senior class gets to graduate from Wabash having never lost the Bell,” a proud Coach Erik Raeburn said. 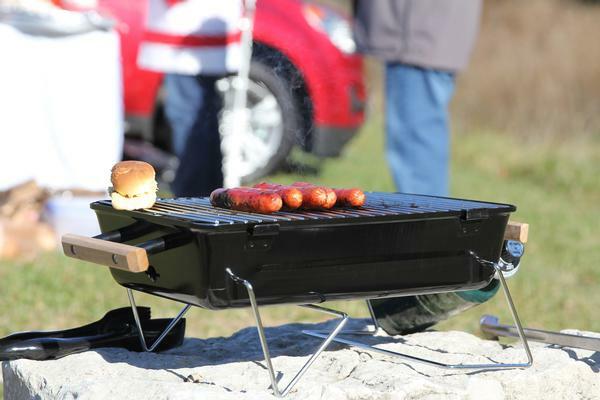 “That’s really important to the guys who go to Wabash. When I first got the job people would introduce themselves, they would tell me their name then give me their Bell record. 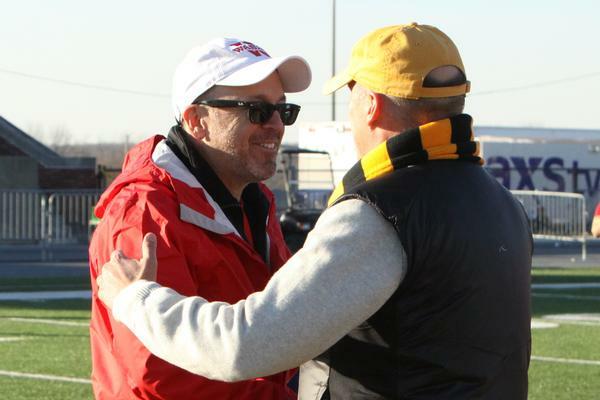 That’s a point of pride for Wabash grads. So now we have another class who can introduce themselves and say they’re 4-0. 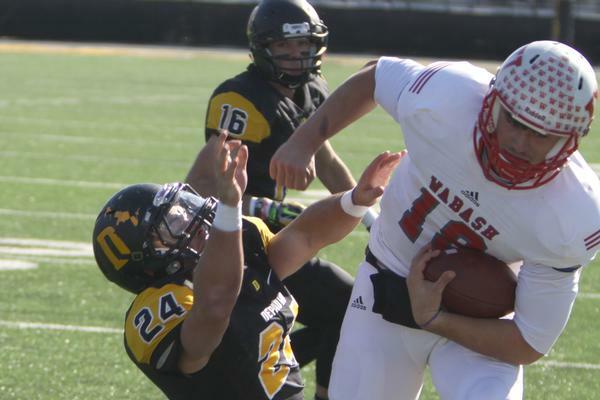 Wabash won because it had one of the Bell game’s most dominant players in the 122-year history. 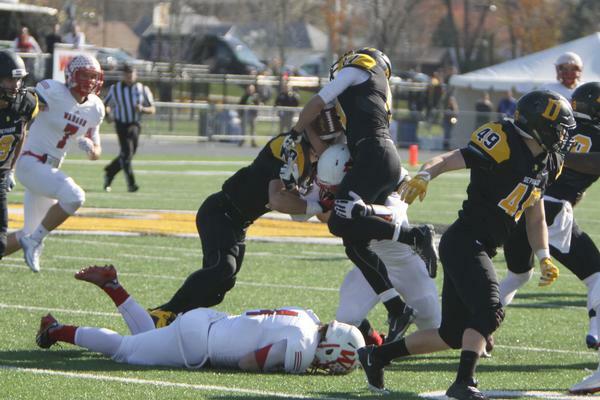 Mason Zurek wanted to do something big for his final Bell game and, wow, did he! 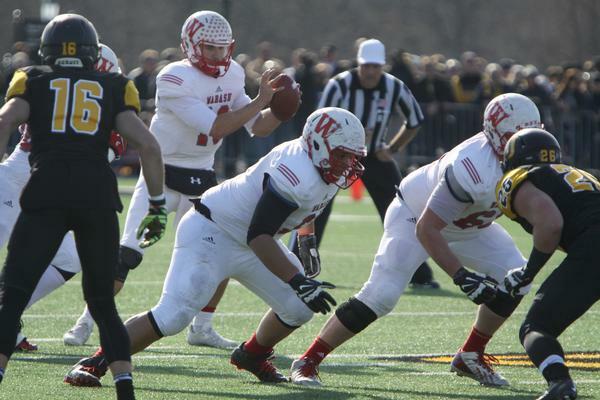 Zurek carried the ball 37 times for 278 yards and two touchdowns. 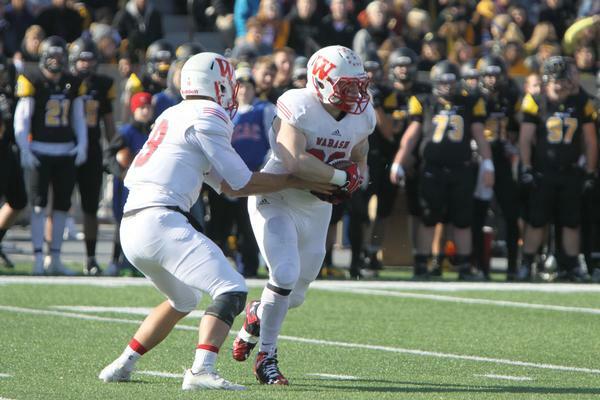 He broke Wabash's all-time single game rushing record of 265 set by Stan Huntsman in 1952. He also toppled Huntsman’s 1952 Bell game rushing record of 248. 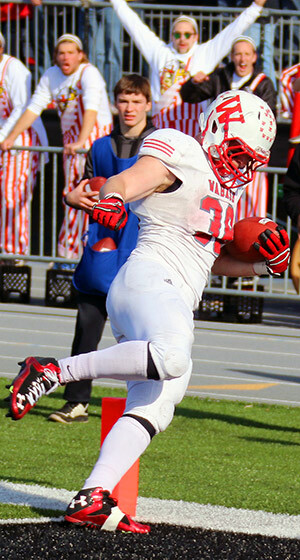 Zurek had two touchdowns and celebrated his first, which put Wabash up 14-0 early, with an exclamation point of a spike. He drew a yellow flag. After the game he reflected on what his huge day meant to him. Had it not been for Zurek’s Superman act, cornerback Delon Pettiford might have been the talk of the Bell victory. Pettiford picked off two early passes. 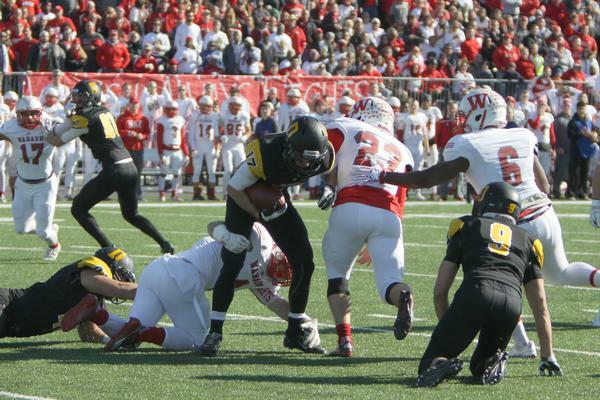 The junior corner picked off Tiger QB Matt Hunt on the fifth play of the game. Two players later Little Giant quarterback Connor Rice hit freshman Oliver Page over the middle to put the Little Giants on the board, 7-0. He’s not bad as a freshman. 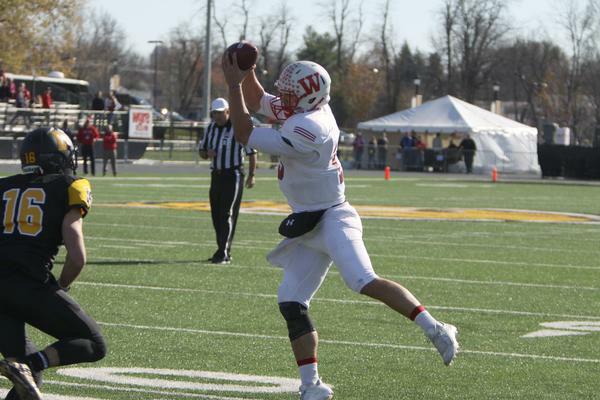 The 6-foot, 4-inch Martinsville receiver had three catches for 74 yards and two touchdowns to lead Wabash. 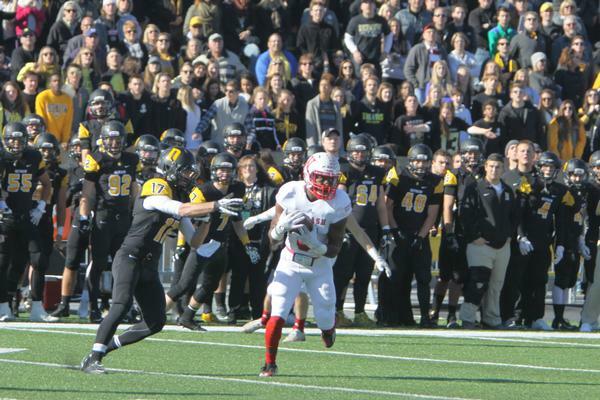 Page’s second touchdown was a juggling act in the corner of the end zone with a DePauw defender hanging on him. 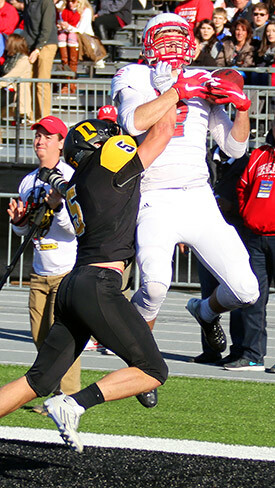 The day’s second spectacular catch belonged to Sammy Adams to close out scoring. 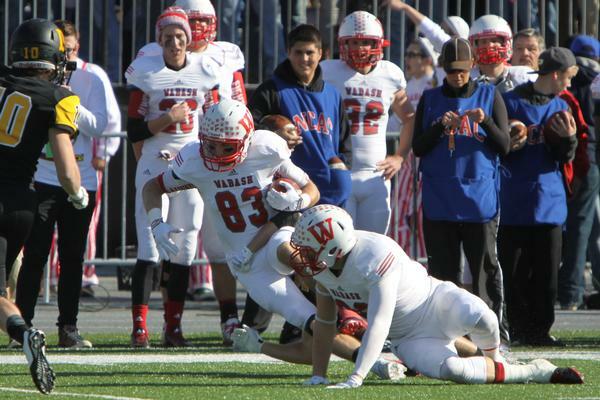 Adams was in the back of the end zone when Rice fired from five-yards out. 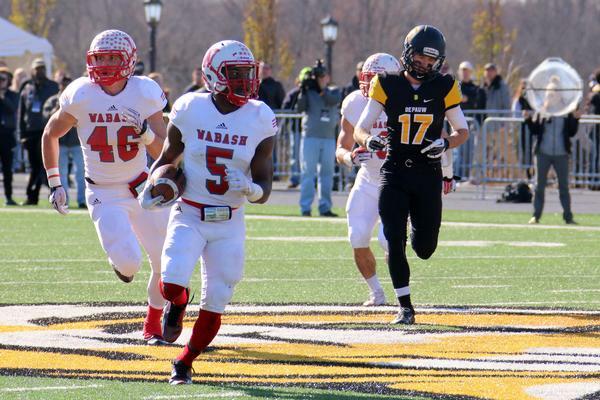 The ball popped up into the air but Adams had it on the rebound with six minutes to play and Wabash up 45-17. Rice finished 10-of-16 for 143 yards and three TDs. 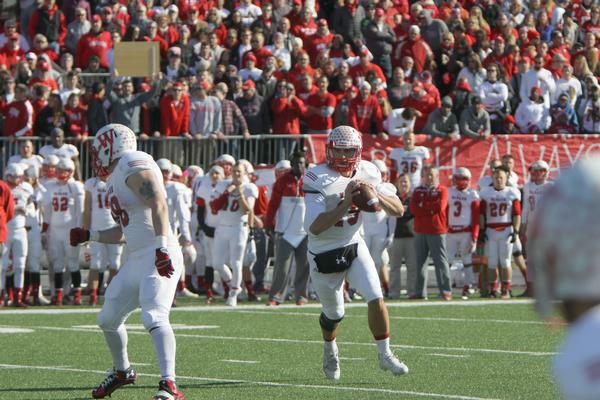 Hunt finished 20-of-39 for 244 yards, two touchdowns, and the two interceptions. Defensively, Pettiford may have got the headlines but Connor Ludwig led the Little Giants with 12 tackles. Austin Brown had 10 stops and Pettiford 8. The team statistics reflected the score. 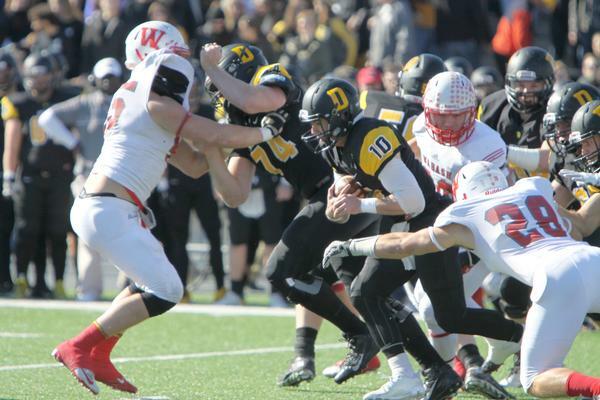 Wabash ran for 355 yards to DePauw’s 147. 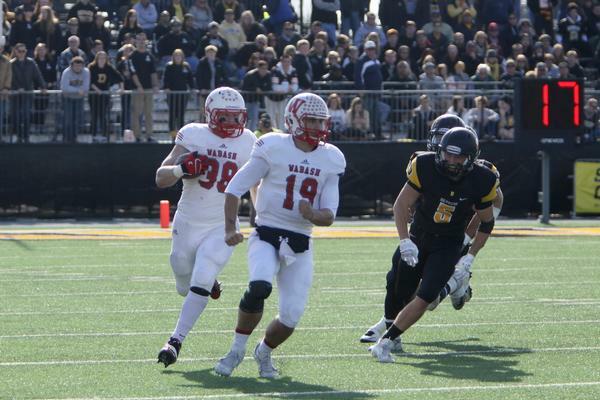 The Tigers gained 244 yards passing to Wabash’s 148. 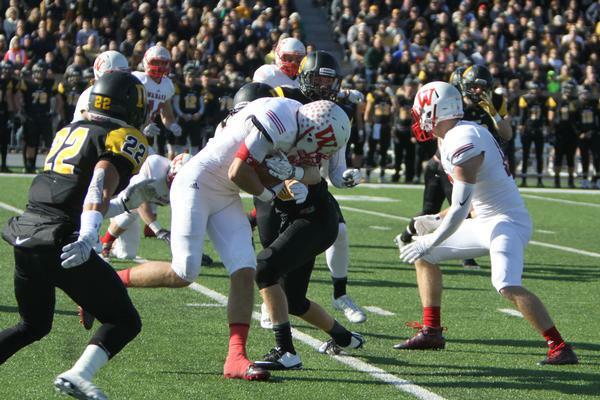 “A Bell win is nice but this is last year I get to play football so at least I have one more week and maybe more,” Zurek said as the Bell rang continuously nearby. Of course, he had no idea about the records. “No, not until somebody told me when I was on the bench. I’m pretty excited about that."